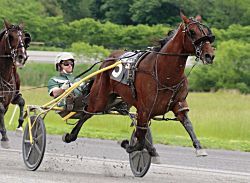 Manalapan, NJ --- Julie Miller could smile after watching a group of her 2-year-old pacers and trotters qualify for the first time Monday (June 4) at Gaitway Farm. “I think we had one hiccup and everything else went OK,” said Miller, who sent out 14 horses in the day’s 11 races for 2-year-olds. “You can’t complain. I wanted them to be behind the gate, be handy, do what you ask them to do; all of them were really nice in that respect. That made us happy. Two-year-olds from the stable of trainer Ron Burke dominated the entries, with 33. All totaled, Miller and Burke sent out 47 of the 55 rookies that competed during the day. Action was delayed from starting for more than an hour because of heavy rain that fell overnight and into the early morning. “Luckily, Gaitway got the track ready to go and we got it accomplished today,” Miller said. Miller’s winners were female trotters French Cafe (Father Patrick-Creamy Mimi) in 1:58.4, Ev’s Girl (Crazed-Lindys Lullaby) in 1:58.4, and Special Honor (Father Patrick-Honor Thy Daughter) in 1:58.3 along with male trotters Soul Strong (Father Patrick-Sheer Soul) in 1:57.4 and Prospect Hill (Muscle Hill-Louise Kemp) in 1:58.3. French Cafe, a half-sister to stakes-winner French Laundry, is owned by breeders Marvin Katz and Al Libfeld. Ev’s Girl, the first foal out of Lindys Lullaby, is owned by Andy Miller Stable, Harvey Eisman and Little E LLC. Special Honor, whose second dam is Dan Patch Award-winner Honorable Daughter, is owned by breeders Brittany Farms, Katz and Libfeld. Soul Strong, a half-brother to stakes-winner Designed To Be, is owned by Stable Why Not while Prospect Hill, the first foal out of Louise Kemp, is owned by Stroy Inc.
Andy Miller piloted Prospect Hill (Muscle Hill-Louise Kemp) to a victory in 1:58.3. Burke’s winners were male pacers De Los Cielos Deo (Captaintreacherous-Lisjune) in 1:56.4 and World On Edge (Roll With Joe-Inanotherworld) in 1:55 along with female pacer Sylph Hanover (Somebeachsomewhere-She’s A Fan) in 1:57. De Los Cielos Deo, a half-brother to Dan Patch Award-winner I Luv The Nitelife, is owned by Burke Racing Stable, Larry Karr, J&T Silva-Purnel & Libby, and the Weaver Bruscemi partnership. 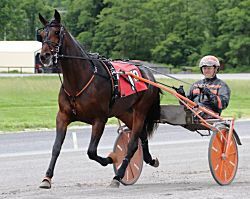 World On Edge, whose family includes two-time Dan Patch Award-winner Worldly Beauty, is owned by Burke Racing, Joseph DiScala Jr., J&T Silva-Purnel & Libby, and Adriano Sorella. Sylph Hanover, a half-sister to stakes-winner Shakai Hanover, is owned by Burke Racing, William Switala, James Martin, and Joseph Critelli. Ron Burke’s winners included male pacer De Los Cielos Deo (Captaintreacherous-Lisjune) in 1:56.4. In addition, Burke’s female pacer Sweet Chrome (Sweet Lou-Camille) finished second by a nose in 1:55.1 to 3-year-old female pacer Ideal Life. Two of the qualifiers for the 2-year-olds included one 3-year-old; the other was won by 3-year-old female pacer I Will Do It, with Shawn Vallee’s 2-year-old Devious Delight (Bettor's Delight-In A Whisper) second in 1:59. The remaining qualifier for the 2-year-olds was won by Joe Holloway-trained male pacer Union Station (Somebeachsomewhere-Hit The Curb) in 1:57.3. The colt, whose family includes New Jersey Sire Stakes champion Lookinforadventure, is owned by Val D’Or Farms, Rojan Stables, and Ted Gewertz. “He went fine,” Holloway said. “I didn’t think we were going to get to go today. At 5 o’clock this morning it was still raining. The track crew did a good job. Complete charts for all the qualifying races can be found above.